Because the original peninsula settled by the Puritans was so small, residents from an early date began to expand it by making new build-able land. This "filled land" was formed by dumping sand and gravel on top of the mud flats that originally existed. This new land was not strong enough to support heavy structures, including multi-story brick row-houses. The map on the lower left indicates where the filling occurred. The area's of the map in black and white indicate filled land. The area's filled in red indicate original land. 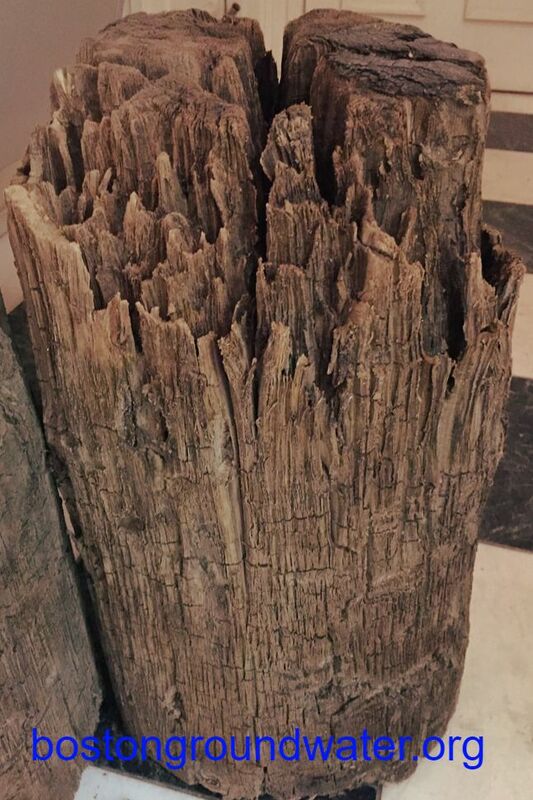 Wood pilings were driven through the filled land and underlying organic silt layer (the original mud flats) typically 15 to 20 feet below existing ground surface. Nearly all buildings constructed on filled land in the early part of the twentieth century and before are supported on wood pilings. These pilings will last for centuries if they remain submerged in groundwater. 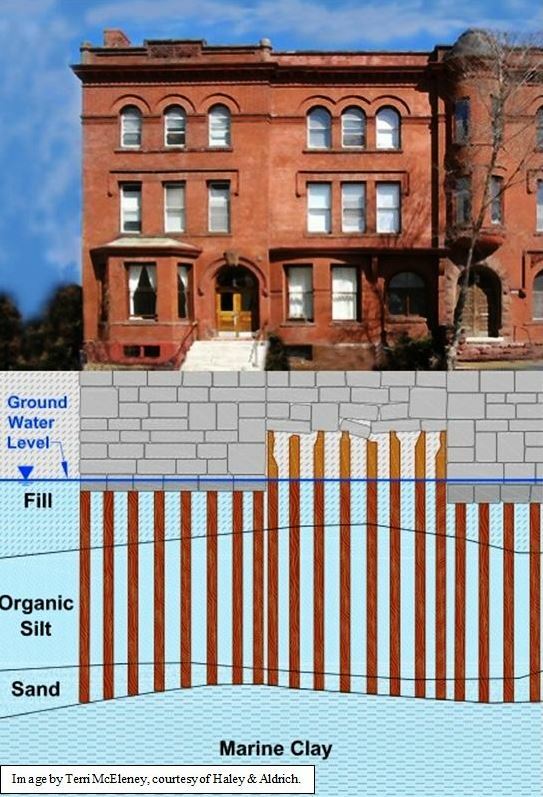 However, (as indicated in the graphic in the upper right) if groundwater levels drop, the tops of the piles are exposed to air, attacked by microbes, and eventually rot. Many Bostonians live or work in older buildings in filled land neighborhoods. 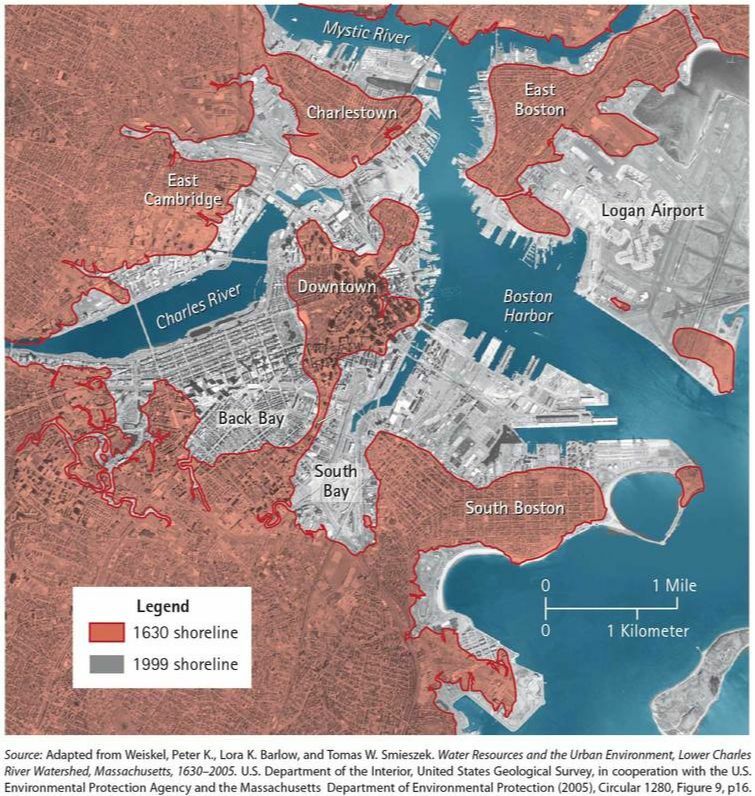 Among the neighborhoods affected are the Fenway, Back Bay, South End, Bay Village, the flats of Beacon Hill, Chinatown, the Leather District, the Bulfinch Triangle, the North End and Downtown waterfronts, the Fort Point Channel section of South Boston, and sections of East Boston. 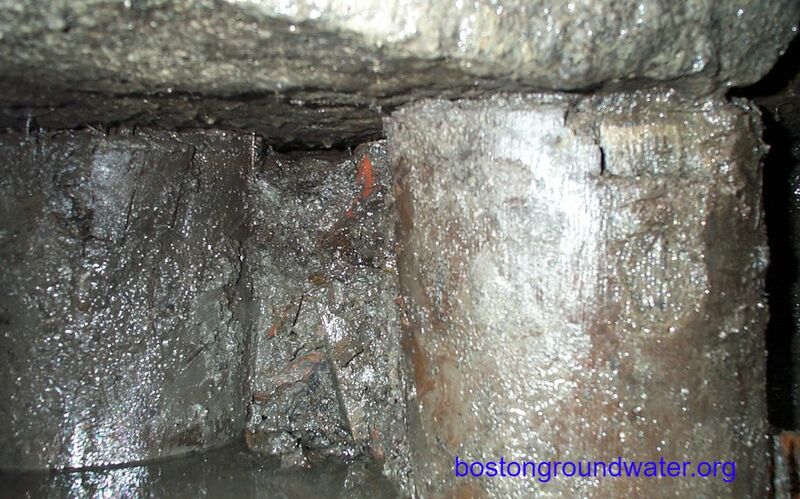 Because this type of building foundation system has been used for centuries in Europe, the potential problem was well known to the builders working on Boston’s filled land. The tops of pilings were generally cut off at a level low enough that builders were confident they would remain submerged in groundwater. However, in 1929, the Boston Public Library’s main building in Copley Square required foundation repairs costing over $200,000 (just under $3,000,000 in today's dollars) because of rotted wood pilings. Groundwater levels had dropped from those which existed in 1888 when the foundation was installed. In the years since 1929, many buildings in Boston have had to have their pilings repaired. ​Why do groundwater levels drop? Over the years since most of the filled land was created, much infrastructure, including sewers, subway lines, highway tunnels, and deep basements, has been built beneath its surface. 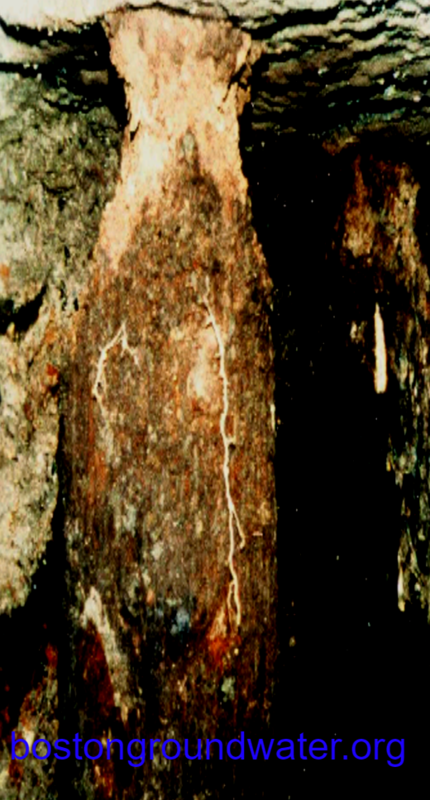 When these structures leak, (as indicated in the cracked pipe image below) the water that enters the structure is often drained or pumped away. 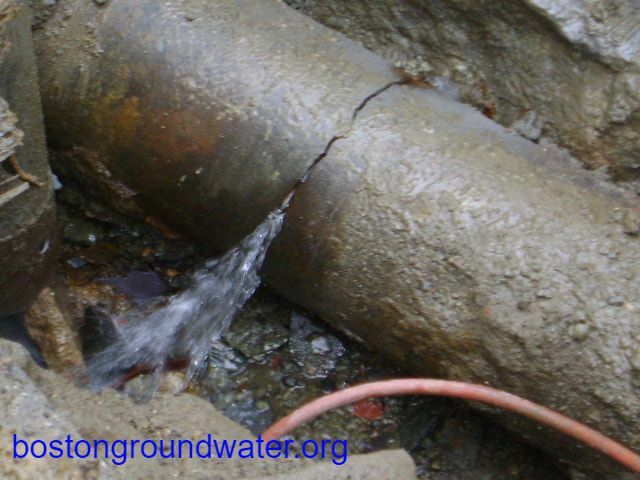 This causes surrounding groundwater levels to drop toward the level of the leak, a phenomenon called draw-down. 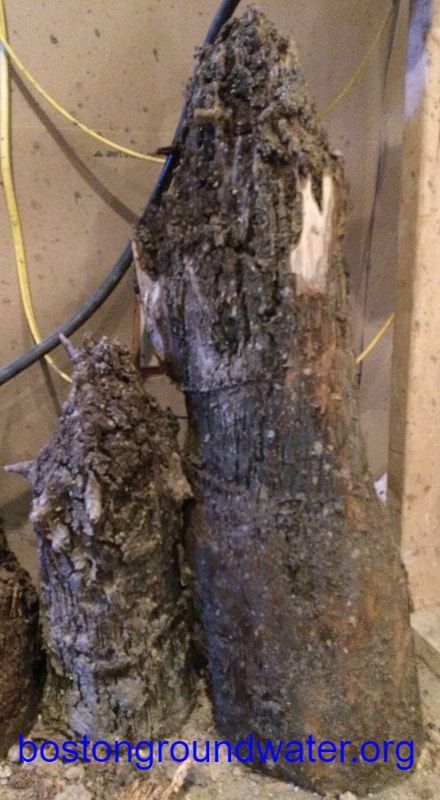 If groundwater levels are drawn down below the tops of the pilings, they are exposed to air, causing the wood to rot. How can I check the conditions of the piles under my building? 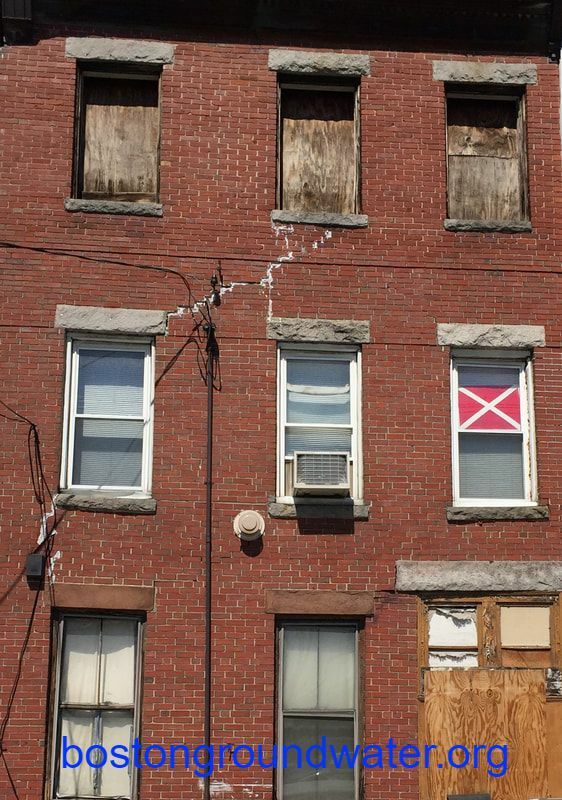 If pilings fail, what happens to the building? Once the wood piles begin to rot the building begins to settle. The building will start to settle and cracks will appear, as seen below. This uneven settlement of the building is known as differential settlement. 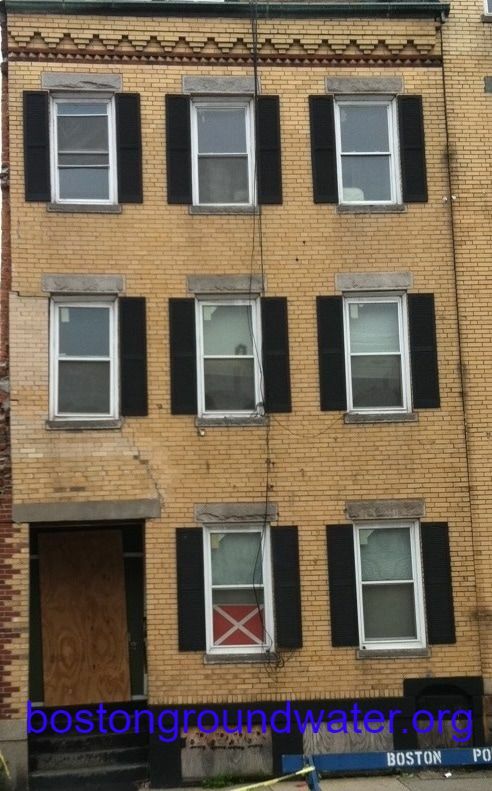 In worst cases, windows and doors become inoperable, floors are no longer level, and, in the worst cases, the building will no longer be safe to occupy. Can failed pilings be repaired? Yes. 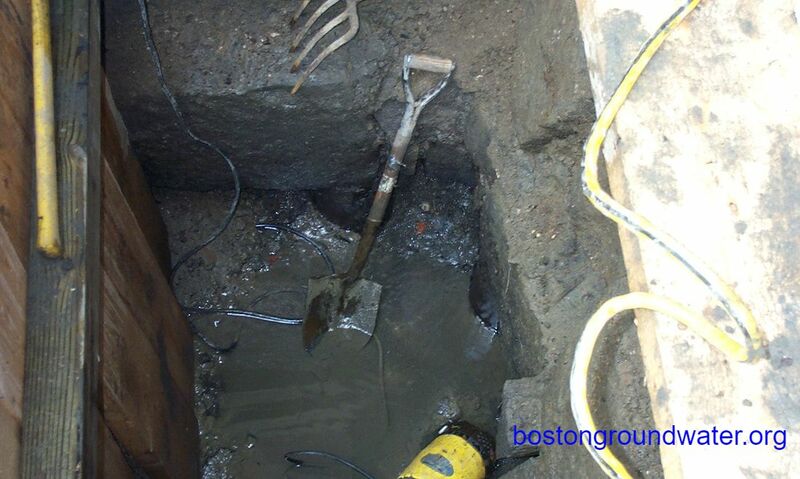 The typical process to re-support a building on its wooden pilings is called underpinning. 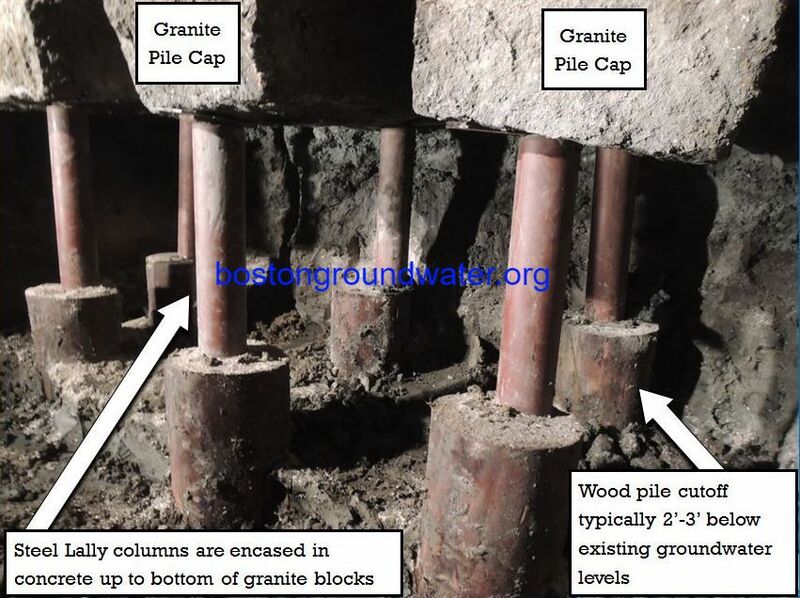 Contractors need to dig underneath the building, cut away the rotted section of piling to below the lowest expected future groundwater level, replace it with steel, and encase the steel in concrete as seen in the images below. The process involves a lot of manual labor and depending on the number of piles that need to be underpinned and the size of the building underpinning can take months to complete. The cost to underpin a typical three or four story row-house can be $250,000 and upwards. Larger buildings have cost far more to repair. ​The good news is that, if groundwater levels again rise to submerge the pilings, the rotting process stops when the air in the wood dissipates. When the pilings were installed, they had a very substantial margin of safety. If there has been no settlement of the building, there is a high likelihood that the pilings are still strong enough to support it. 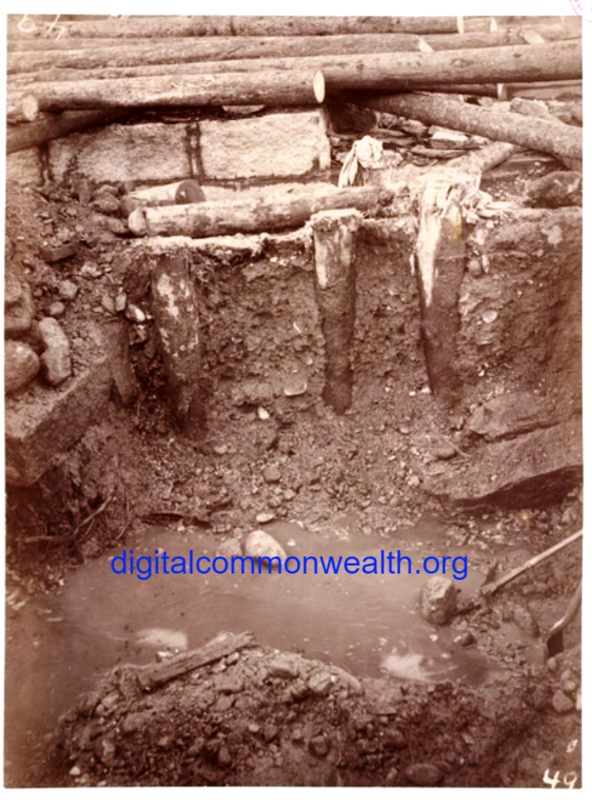 However, in some cases, pilings may have rotted, but there has not yet been obvious settlement of the structure. 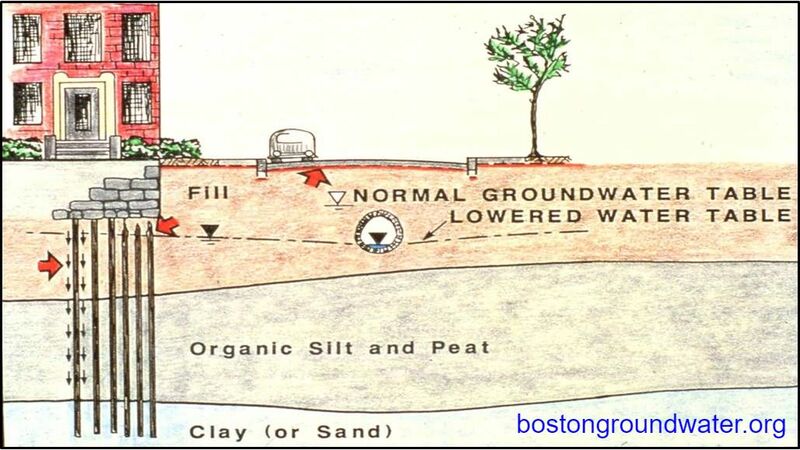 In 1986, the Boston City Council established the Boston Groundwater Trust to monitor groundwater levels in areas of the city where foundations are threatened by low levels and to make recommendations to solve the problem. After a slow start, Mayor Menino revived the Trust in 1997, appointing a new board of unpaid trustees. The trustees, who are unpaid volunteers, discovered existing groundwater observation wells that had been installed on public property for various projects and incorporated them into a monitoring network. In 2002, the Legislature included $1.6 million in the Environmental Bond Bill to build out a comprehensive network. In 2005, the City and State governments came together to sign a Memorandum of Understanding creating a City-State Groundwater Working Group that includes all of the public agencies responsible for the underground infrastructure. (LINK) Among other things, all of these agencies have pledged to work together to understand the causes of the problem and to repair those problems for which they are responsible. (LINK) The City has established a Groundwater Conservation Overlay District that requires people building or renovating properties in the affected area to make sure that their projects will not cause any reduction in groundwater levels and to incorporate systems that will recharge rainwater into the ground instead of sending it into the streets and storm drains. If you have groundwater coming into your property, repair the leak, don’t pump the water away. Even a small sump pump can cause a significant lowering of groundwater levels for you and your neighbors. You can also install a recharge system that will capture rainwater from your roof and infiltrate it into the ground. These drywells need to be properly designed and installed so that they will properly infiltrate water into the ground without potentially causing flooding problems. Over the years, much of the unpaved surface in the affected neighborhoods has been covered with buildings and impervious blacktop. Although Boston gets a substantial amount of rainfall each year, only a small percentage is finding its way into the ground. 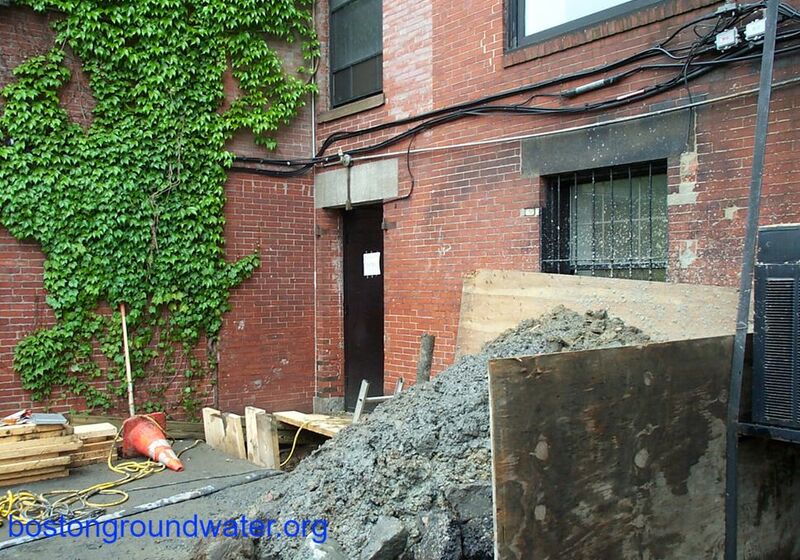 Because of its made land and many old buildings, Boston will always be vulnerable to groundwater related problems. However, if we work together to fix the leaks and install recharge systems and continue to monitor for new problems and address them as soon as they arise, the problem can be managed. We have already seen groundwater levels rise in areas where infrastructure has been repaired and water recharged. With more of these efforts, we can raise the groundwater levels in other areas where they are low. We can save our homes from the cost and disruption of groundwater related foundation repairs.